SAN JOSE, CA – If on November 25,th you were in the San José Center for the Performing Arts attending the opening night of CIRQUE DREAMS HOLIDAZE, the Season’s second show of BROADWAY SAN JOSE a Nederlander Presentation, listening to the song “Once Upon a Dream” you might have wondered if you were dreaming, when on the stage, representing a snow-covered forest, the “ornaments” hanging from the Christmas tree: a Flying Angel, walking poinsettias, a clown, a soldier, the Queen of Ice, and different Dickens’ characters dressed in elaborate costumes, descended from its branches and became alive by the “magic” of NEIL GOLDBERG,s who created and directed the show. And when they stopped being the tree's “ornaments” and turned into Performers, what a variety of “talents” these international artist showed us on that night. To start with, in a fairy-tale looking spectacle that transported the audience, vicariously, to the world of dreams, we saw the "toys" singing and dancing together many times. We also saw each one of them doing an act, that we may have seen done before by another person, but…it was done differently this time. 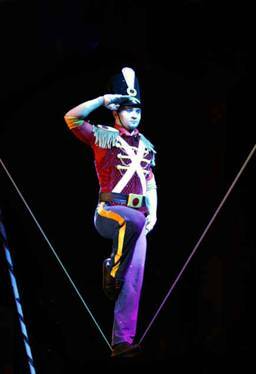 Like marching, instead of walking in a high wire, in a daring act performed by the “Balancing Soldier” IGOR GOLINSKY (from Russia) who does not carry a pole to balance his body, or the unique act of another by another acrobat, who swirls, over the presents from a candy cane. Among songs and dancing the acts change rapidly, and each one of them is fantastic. On that night, for instance there was an act where the main gymnast is a little girl, who presents her number with a man. The man tosses her in the air several times and catches her, sustains her in one of his hands while she stands in pointe in one leg, like the ballerinas do in ballet, and holds her in both his lifted arms over his head, with both her legs opened wide at both sides of her body. There is a Chair Stacker. A dance of penguins which was superb, an ice skating act with both skaters a man and a woman skating over a circle on the stage, spinning very fast: The man spinning the woman holding her by the legs, or by a loop around her head as she spins her body around herself. There is also an unbelievable “magic” show in which both a man and women change clothes, in seconds, in front of our eyes. We see men and women spinning around the stage inside circular hoops. A man who builds a tower of crystal glasses over a tray, lights four candles around them, and then climbs a ladder carrying the tray on his forehead. The list is endless. It needs to be seen. 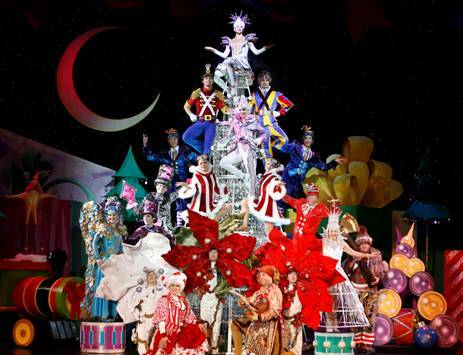 With its 300 costumes, 20 acts, and 30 international performers, “CIRQUE DREAMS HOLIDAZE is stuffed with so much holidays cheer, that has the charm, sparkle and talent to delight the whole family. The spectacle may be described as "A gift to the Eyes." Founder and Broadway Director NEIL GOLDBERG had transformed it into a global entertainment brand a business empire widely respected by by critics, industry leaders and fans. 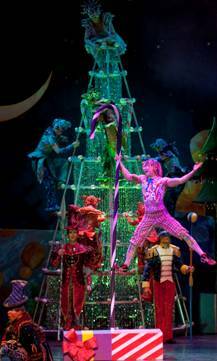 Since l993, CIRQUE DREAMS shows have entertained over 50 million people across thousands of cities around the world, in theatres, casinos, theme parks, cruises lines and Broadway. Now we have the unique opportunity to see it here. Or by phone at (800) 982-2787.